Traditionally fish is one of the staple dishes in many communities of Nepal. But with the rising popularity of exotic Asian delicacies such as sushi, sashimi, and tempura, the consumption of fish has steadily increased in the country. The inclining rate of consumption has made an impact on the demand rate of fish in the market. However, to fulfill the rising demands, the current production has to be increased by many folds. In an article published in “The Himalayan Times” dated; 17th June 2018, approximately 60% of the demand for fish in Nepal is fulfilled by importing it from India. With the proper utilization of available resources and development of required infrastructure, Nepal can not only decrease import of fish but will be able to export fish to other countries. Fish contains around 20% protein which is higher than milk and cereals. It also contains Omega-3 or N-3 fatty acids. These health benefits have been one of the major reasons for increasing fish demands, especially among the health conscious population. Furthermore, trout fishes can help reduce weight while retaining muscle mass and maintaining appetite. Fish is beneficial for a healthy heart as well as to promote the development of brain and eyes. Due to the various health benefits from consumption of fish, the Government of Nepal has recommended at least 30g of fish or animal protein diet per day. Nepal has a wide variety of fish with about 200 species available, of which around 190 are indigenous species and remaining are exotic species. The major breeds include Silver carp, Bighead carp, Grass carp, Rohu, Catla, Mrigal and Rainbow trout. Traditionally, Tharu, Kewat, Das, Kahar, Mallaha, Lodh, Gaud, Gahar, Kumal, Gupta and Magar tribes were involved in the farming of fish. But today, more people are engaged in this sector and fish business is not limited to these tribes only. Currently, there are many private fisheries running at a small scale which produces a decent amount of profit. The government has recognized fishery as one of the important factors in providing employment to the local people of Nepal and has given great emphasis on developing the fish industry. The budget speech of the fiscal year 2073/74 has focused on making Nepal a self-sustaining country in fish production in the next 3 years. To achieve such an ambitious target, the current production needs to be increased and a lot more manpower must be employed in the fishery. Fish production has increased well in the past years. However, further, improvement is essential to increase the production rates. In 2063/64 B.S., the total production was only 46,779 tons which increased up to 64,700 tons in 2070/71 B.S. Today, 77,000 tons of fish are produced annually in Nepal. Despite this, local markets can only meet about 40% of the demand and imports fish worth around Rs. 3 billion from India. A large portion of the market demand in Nepal is fulfilled by fish imported from India which is transported to Jhapa’s Kakadvitta, Bhadrapur and other border points. From there, they are dispatched to the markets in various districts to be sold to the consumers. Likewise, locally harvested fish are cleaned with fresh water and packed into bamboo baskets with an alternating layer of ice which is then loaded into buses and transported to market centers where they are sold. Lack of sustainable fingerlings supply system: Normally, fingerlings are produced by government fish farms and sold to private fish farms. The current fingerling farming doesn’t produce an adequate amount of fingerlings and the quality of the produced fingerlings are not up to par with the industry standard. Not enough infrastructures present: Cold storage facilities and marketing infrastructure, that play a significant role in the fish industry, are not abundantly present in Nepal. Nepal also has no fish-processing factory to produce meat from all the fish and lacks essential machinery and infrastructure. 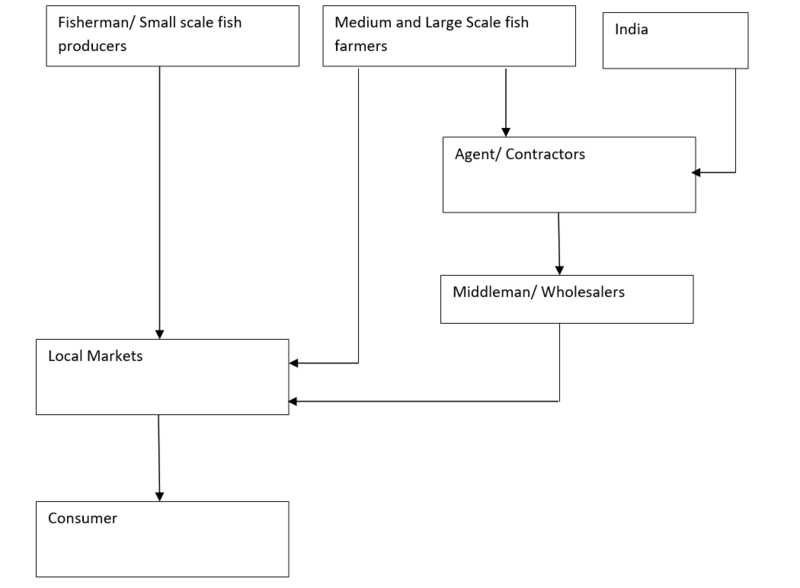 Demand-supply gap: The total production of fish today can only meet about 40% of the demand from the consumers and the majority of the fish sold in the local market comes from India. Due to lack of security check near the borders, it has given a passageway for importing harvested fish from India which has fulfilled most of the demand for fish in Nepal. Lack of training and knowledge: People involved in fisheries in Nepal don’t have proper training and knowledge regarding this sector. According to a survey conducted in 2072 by the National Planning Commission of Nepal under the Department of Agriculture and Forestry, only 34% of male and 44% of female working in the fishery have taken proper training. Many workers have poor scientific knowledge of indigenous fish species and their awareness of the industry is limited. It is recommended that the Nepal Government address the basic problems faced by the farmers by prioritizing access to fingerlings supply, fish disease diagnostic facilities, development of fish marketing channel and cold storage facilities. Lack of proper facility at local levels is a huge challenge to meet the current market demand fish. Starting up and running a fish business is comparatively cost-effective as fish feed and fingerlings are sold at affordable prices. Nepal has abundant unused water resources like rivers, lakes, man-made reservoirs, swamps, ponds, and other water bodies preferable for fisheries and aquaculture development. They provide excellent habitat for fishes. Local people and small businesses utilize this to engage in the fishery. There are various species of fish that can be grown faster and harvested. Entrepreneurs can take advantage of this and explore rapid profit-making opportunities. 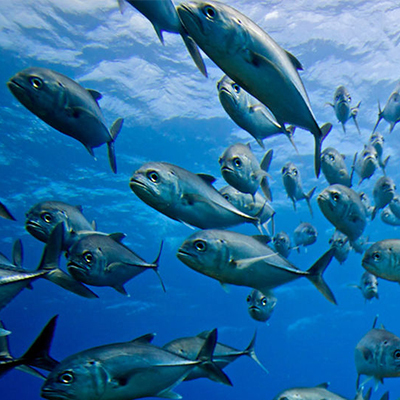 Proper infrastructure and facilities should be developed for increasing the shelf life of fish. The shelf life of fish can be increased by freezing, canning or curing them, among which canning provides the longest shelf life up to 5 years while curing lasts a few months. Commercially frozen fishes can last up to 10-12 months and if the fishes are thawed properly there will be no difference in the texture of the fish. Cold storage facilities should be expanded to more areas to preserve the standard of the harvested fish and keep it fresh for a longer time. Fish processing factories should be established at major hubs like Kathmandu, Chitwan, and Pokhara from where it can be transported to other places for the fish to be sold. Fish industry is relatively unexplored in Nepal. The existing industry is only limited to rearing fish due to which there are prospects for entrepreneurs in the areas of harvesting, processing, marketing and distribution of fish. Businesses can invest in these areas and explore the opportunities to reap benefits and help Nepal realize its true potential in the fish industry.